Here’s a little detail in iOS 7 that I hadn’t noticed or read about before. 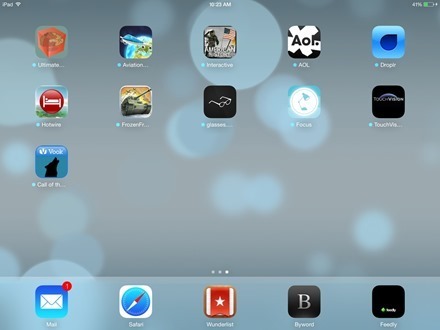 There’s a new symbol used on app icons to indicate apps that have arrived on the iPad via automatic downloads. There’s now a little blue dot just to the left of the app’s title text to show that it’s one that was added via an automatic download. Automatic Downloads is a feature that you can toggle on or off in Settings. When it is turned on all of your new purchase (including free app installs) on any of your other devices with your iTunes account setup will automatically download to the iPad. So, for instance, I recently installed all of the apps shown in the screenshot above on my iPad mini. I have Automatic Downloads enabled on my iPad 3 which is running the current iOS 7 beta 2 – so each of these apps has been added automatically to the iPad 3, and has the little blue dot next to its name. I also notice that apps that are newly installed no longer have a ‘New’ badge across their app icon in iOS 7. These are very minor little tweaks, and they may not last through the betas and into the final release of iOS 7 – but I’d say the blue dot for automatically downloaded apps is a helpful addition. In my case, it served to remind me that I had the Automatic Downloads feature enabled.